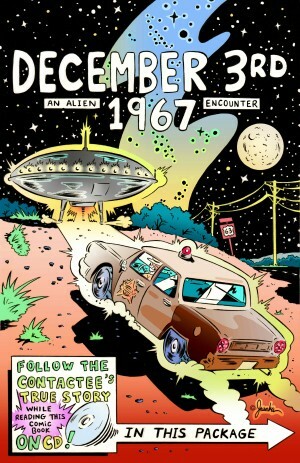 Michael Jasorka, internationally published cartoonist from Los Angeles, will be at Page One Bookstore 3:00 pm Saturday, August 11, to talk about and show his newest graphic novel, "December 3rd 1967: An Alien Encounter," which uses the found audio of ex-Nebraska state patrolman Herbert Schirmer and his tale of being taken aboard an alien spacecraft back in 1967. For his book tour, Jasorka has created a frame-for-frame 25-minute comic experience adapted for the screen. Page One Bookstore is located at 11018 Montgomery Blvd NE in Albuquerque (southwest corner of Montgomery and Juan Tabo). The Jasorka event is free and open to the public. For more information, please call 294-2026 or visit page1book.com.